With a demanding schedule; work, chores and taking care of children, it is tough to find time to clean your kitchen fast. We have compiled our favourite tips and tricks on how to clean your kitchen fast so that you can make the most of your spare time. Instead of cleaning everything up and organising everything at the same time, work with little things first. Working on smaller tasks first and not trying to do everything at the same time will make your life that little bit easier. It’s too easy to feel overwhelmed trying to clean your kitchen. By working on small things first, you can solve everything you need with relative ease. Just do not work on everything at once. You can take small steps to clean your kitchen and do things on time. If you’re searching for a simpler, scrub-free way to clean your microwave then a vinegar solution is your best bet. You can employ a vinegar and water solution in a microwavable bowl to steam clean your microwave. A properly made vinegar solution will conveniently help steam away hard-boiled foods and other junk from your microwave in seconds. Once you have allowed your solution to steam clean the microwave, take a clean, warm, damp cloth and wipe away all the dirt with ease. Make use of wet and dry erasers to clean up all the grime and grease from your oven glass. Start brushing in small sections until the whole glass is clean. You will love the result! If your oven is more than filthy, maybe it’s time to reach for those harsh chemicals, this will breakdown those mystery residues and lumps. This is something you should spend time completing though, making sure no chemicals are left in your oven. If you don’t have time to put everything back in the right place, then be sure to use a box or bag to store all the unwanted items. This way, they’re out of sight and out of mind, meaning you can get back to sorting them out once you have the time. For younger children you can create allocated boxes for those pesky toys and reward them every time they clean up after themselves, saving you a job and time. Most germs are in the kitchen sink, except for the sponge, you should replace your sponge often, this will prevent the build-up of germs. Wiping over your sink every day with an antibacterial product will prevent germs from festering in your sink, we also recommend filling your sink with bleach and warm water once a week. This will kill those germs which weren’t removed the first time over. Kitchen sponges and dish towels require regular disinfection. Forget the soaking and mixing hours and focus on fast and effective disinfection. Once you have washed your dishes, simply bathe your sponges in a concentrated bleach and put them in the microwave. This will not only remove stains and food waste, but the heat will also eliminate the germs and bacteria that have been installed inside the sponge. Replacing your sponge once or twice a month is also a great idea. Washing your towels once a week will stop you drying those clean dishes with a bacteria covered towel. In the meantime, making sure they dry fully before using them again will help to keep mould and bacteria away from your appliances. 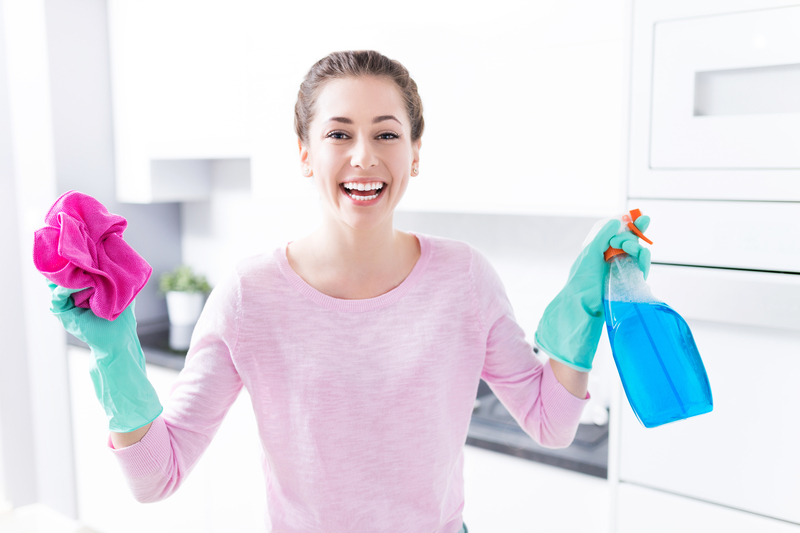 If you’d like to speak to us about our cleaning services and how we can help keep your kitchen sparkling clean, please feel free to get in touch.